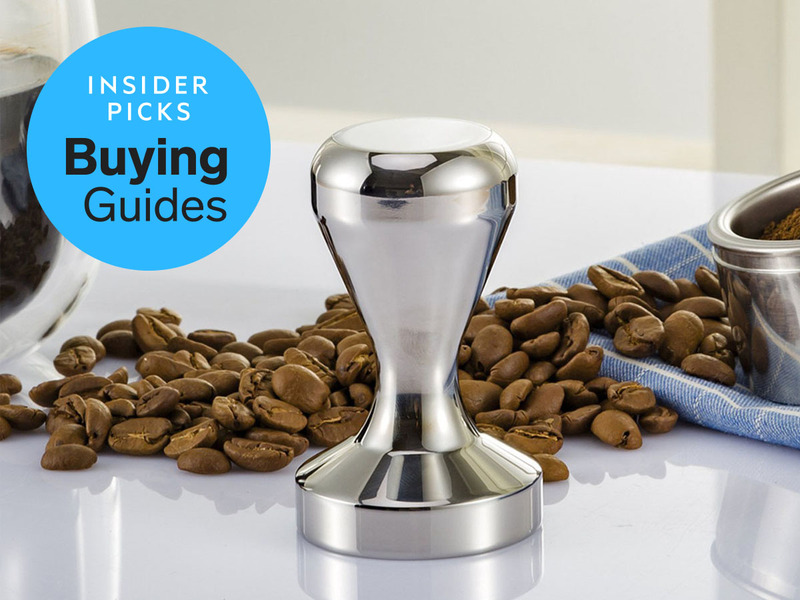 Our top pick is the Decent Espresso Tamper because its calibrated pressure settings and precise design make it the best espresso tamper you can buy. Making espresso is all about precision. Tiny changes in temperature, pressure, dose, and yield can turn a delicious shot into something so bitter it’s undrinkable. Tamping the grounds is a key part of the espresso process and that’s why we think the Decent Espresso Tamp, with its calibrated pressure settings and precise manufacturing, is the best pick for most home baristas. Every barista has their preferred tamper, and many professionals even bring their own to work. Once you find your favorite tamp, it should feel familiar in your hand and allow you to apply even pressure to your portafilter without much thought. That’s particularly important when you’re in a pre-coffee morning haze. When selecting the best tampers for our guide, we looked for a few key attributes. The first is precision. If a tamper isn’t the same size as your portafilter, some of the coffee will go uncompressed, and this will result in an uneven extraction as the water from your espresso machine will follow the path of least resistance through the untamped grounds, and you won’t get the delicious drink you’re looking for. We also looked for tamps that felt good in the hand, both in terms of size and weight. Finally, we assessed durability and aesthetics because when something lives on your kitchen counter, you want it to look good and stay looking good. Why you’ll love it: The Decent Tamper’s calibrated pressure and precision manufacturing ensure you get the same tamp on your coffee every time and the big, round, burnished handle feels and looks great. Making espresso can be frustrating. Even when you spend a lot of time and money, you can end up with a frustratingly inconsistent coffee quality. One major variable that impacts the quality of espresso extraction is the compression or tamping of the grounds in the portafilter. The two major tamping errors that lead to bad coffee are uneven tamping and a ring of untamped coffee due to imprecise manufacturing. For professional baristas, tamping can also lead to injury, either from overuse of the wrist or from slipping. Decent Espresso took its science-based approach to espresso making and got to work on solving these problems. The result was the Decent Tamper, which one expert described as a „game changer“ for baristas. The genius of the Decent Tamper is in its carefully calibrated spring. This ensures exactly the same tamping force of 25 pounds is used every time. Tamping inconsistently makes it hard to ensure a consistent high quality cup. Another potential pitfall when tamping coffee is an uneven tamp, which compresses one area of the puck more than another. This will lead to water flowing through the least-tamped area in the coffee puck and a poor-quality espresso. The Decent Tamper addresses this problem with a precisely machined to fit exactly into a modern 58.7-millimeter portafilter basket without leaving any untamped coffee around the circumference of the puck. The fit is so tight that Decent Espresso had to machine grooves into the tamper to prevent it sucking the puck out of the portafilter as it is withdrawn. This tight fit also makes it much easier to achieve a level tamp, which ensures even extraction. In our testing, we found that the Decent Tamper feels great in the hand and delivers consistent and reliable results. With several machines to test, that allowed us to change everything from temperature to pressure to flow rate, it was a relief to have tamping pressure be a consistent variable. Even when focusing on testing a machine or a grinder, this was the tamper that we reached for again and again, making it our pick for the best espresso tamper. Why you’ll love it: The wide variety of colors and unique appearance of the PUSH Tamper might be what appeals to buyers at first, but the precision and repeatable tamp depth will make this a favorite over time. The PUSH tamper appeared on the specialty coffee scene after being used by UK Barista Champion Maxwell Colonna-Dashwood at the 2015 World Barista Championship. The chances are, you won’t be competing with your coffee any time soon, but if you are looking to get the best possible cup, there’s a lot we can learn from the pros. The PUSH tamper doesn’t look like any of the other tampers in this lineup. Indeed, you might mistake it for a hockey puck. The PUSH tamper works by pre-setting the depth to which it will tamp and then only tamping that far. This means that, as long as you do not change the dose of coffee in the portafilter, your tamp will be level and equal every time. One expert tester said that „the PUSH tamper proved to be an extremely reliable tool for producing a balanced shot of espresso.“ The same tester also noted that due to the design of the PUSH tamper, there was less chance of overstressing your wrist from tamping. The PUSH tamper is made by a company called Clockwork Espresso, and its design came out of a desire on the part of founder Pete Southern to help his office colleagues make better espresso. The design has caught on thanks to the ease of use and consistent tamping that it offers. We found that the hockey puck sized tamper was easy to master and allowed us to dial in our shots without worrying about tamping as a variable. Why you’ll love it: Classic design combined with precision manufacturing make the Rattleware tamp a dependable tamper that is comfortable for smaller hands. Baristas come in all shapes and sizes, and yet tampers often come in only one. For baristas with smaller hands, long handles can make for difficult tamping and often lead to uneven pressure or just feel uncomfortable. Fortunately, Rattleware produces its tampers in short along-handled versions ensuring that everyone can have a comfortable tamping experience. The Rattleware tamper might be smaller, but this is no toy. The stainless steel construction means it will far outlast cheaper tampers, with one former café manager saying that the tamper was of a high enough build quality for commercial use in his Amazon review. Fit is also precise, where many cheaper tampers are close to their stated size, every review we saw stated that this tamper is a perfect fit at its stated size, which is important for ensuring an even tamp and quality shots. The Rattleware tamper feels weighty enough to be sturdy without being annoying to hold and it comes with a short and long handle, meaning that even home baristas with small hands will find it a comfortable fit. Reviewers on specialty coffee site Seattle Coffee Gear praised its great hand feel and sturdy construction, many felt it was a worthwhile upgrade to the plastic tampers often supplied with machines. Unlike lightweight plastic models, the Rattleware Tamper provides „just the right amount of heft“ according to one Amazon review.